A night of comebacks, retirements, cuts, knockdowns, prospects and World title ambitions were all in the mix at the Motorpoint Arena, Cardiff on Saturday night. ‘The Second Coming’, Matchroom promoted show had something for everyone as they served up a ten fight bill for the Welsh public. With so many sub-stories, it is difficult, as to where to start – but that must go to one of Wales’ favourite sons; Gavin “The Rock” Rees. The boxing public wanted a rematch with Gary Buckland and the two Warriors obliged. Back in the same venue, on February 1st, Cardiffian Buckland edged a points win in an absolute War. This time it was, Rees who had his hand raised after another compelling twelve rounds. After four rounds, it looked like we were going to be in for another close night, that would split opinions, then Rees’ jab and boxing skills started winning the rounds, as he picked his counters superbly, while Buckland continued to come forward and apply pressure but was getting picked off. Both gave and landed hard shots and dug into the body but it was with less regularity, compared to the first encounter. It was still highly engaging and competitive through-out the twelve rounds. I scored the bout 116-113, to Gavin Rees and was surprised that one judge, Richard Davies, gave it by the same score to Gary Buckland. Buckland was once again full of spirit and determination but this time Rees was clearly the winner, and judges John Keane and Victor Loughlin scored 117-112 and 117-113 respectively. Gavin Rees, has earned his retirement the hard way and the popular boxer has given fans excitement and drama, over many years, and he goes out on a well deserved win. His final career record is 38-4-1, while Gary Buckland’s record now stands at 28-4. 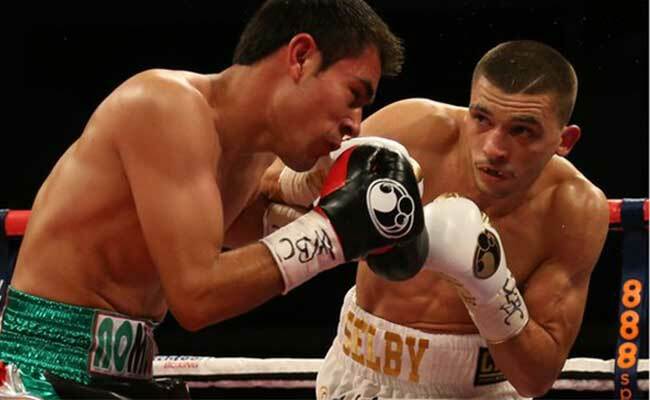 Lee Selby of Barry, was in cruise control over Mexican opponent Romulo Koasicha as he registered a clear-cut twelve rounds points victory, in a WBC featherweight Eliminator. Not too much was known of the Mexican, going into the fight and I’d only seen two of his fights but he proved game and sported a good chin but he was outclassed in every department. Whatever he tried, Selby had an answer for and it was the Welshman that had things mainly his own way, though did get caught with a hard left in the eighth round. 23-year-old Koasicha, seemed to change tactic each round, one round going forward – the next going back. No matter which tact, he took he was still losing the rounds and it was simply down to the gap in ability. Lee Selby, has good power but it is the silky skills that he employs which makes it all look easy, he swept the rounds and is now very close to a WBC title-shot. Lee Selby’s record improves to 19-1 and Romulo Koasicha falls to 21-4. Nathan Cleverly returned after last losing his WBO light heavyweight title, in the same venue, to slay a few demons plus Shawn Corbin. Looking big and strong, as a Cruiserweight, the outcome was never really in doubt from the moment the fight was announced and the 27-year-old from Cefn Fforest didn’t disappoint. Starting the first round purposefully, Nathan got down to business and near the end of the round had rocked the Trinidad And Tobago native, in a neutral corner. It wasn’t too long before referee Richie Davies, was called to act as Corbin was on the receiving end of a sustained two handed assault, along the ropes and then near the corner. Hard, slamming shots were hitting home with far too much regularity and the referee rightly intervened. Nathan Cleverly picked-up the WBA Inter-Continental cruiserweight title, with this second round stoppage victory and his record improves to 27-1, the defeated Shawn Corbin’s record now drops to 17-5. Liverpool’s Callum Smith rode into the Welsh capital with a hard-hitting reputation and the 24-year-old didn’t disappoint against Swansea’s Tobias Webb. Smith’s WBC International super middleweight title was on the line and a battle of jabs opened the first round, though it was the challenger who was slipping shots better, while Smith was a more upright target. Webb took the opener and we looked set for a close fight. Four knock-downs later, we’d all got to witness the power that Callum Smith possess’, as he set about a torrid assault with crippling body shots, that had Webb down and in agony. Tobias kept struggling-up but was met with more and more of the same. Referee Victor Loughlin, finally finding some mercy to call a halt at the 2.50 mark. Callum Smith’s impressive unbeaten run continues to 11-0, while Tobias Webb suffered only his second defeat and is now 14-2-1. In the other live fight, on SkySports; Paul Smith of Liverpool kept busy against the out-gunned Spaniard David Sarabia. There was a huge gulf in experience between the two, going into the bout, and that gulf was also in ability. A right straight down the pipe, dropped Sarabia in the opening round and Smith just had too much power. In the second Smith showed good timing and let loose with a hard barrage that prompted referee Clarke Joslyn to correctly intervene. Paul Smith is now on the hunt for a shot at Arthur Abraham’s WBO super middleweight belt, and his record increases to 35-3. David Sarabia suffered his first stoppage loss and his record drops to 7-4-2. Garnant prospect Chris “Rok ‘n’ Rolla” Jenkins was, surprisingly, the last fight of the night but put in a high energy, purposeful performance as he sparkled against the tricky, counter-punching Miguel Aguilar from Nicaragua. Light welterweight Jenkins started the contest fast and sharp and maintained the pace, right up to the finish in the seventh. A big right-hand forced Aguilar to turn away hurt and referee Clarke Joslyn called a halt to proceedings. Aguilar wasn’t happy with the stoppage but he hadn’t won a round, despite a decent effort, as Jenkins put in a masterful performance and completely controlled the fight. Chris Jenkins remains unbeaten at 15-0, while Miguel Aguilar is now 10-8. Berkshire’s Marc Douglas, will be scratching his head today and wondering how he doesn’t have another ‘W’ in the win column. His bout with Dale Evans was above the welterweight limit and set for eight rounds. St Clears Evans started the first round well, establishing the jab and the quicker of the two. However, in the second a right hand from Douglas, dropped Evans though referee Reece Carter ruled a slip. Evans was shaken-up and it was not too long before he was down again from another right hand. So, a 10-8 round to Douglas, though should have been 10-7. Douglas, right hands continued to trouble Evans in the third round, as he was finding a home for them, Evans finished the round strongly as he appeared to shake off the daze he was in. The fourth round was competitive again, with both men having spells of success but proceedings were abruptly called to a halt due to a clash of heads, causing a nasty cut over Dale’s left-eye. As per BBBoC rules the bout was declared a Technical draw; as four rounds hadn’t been completed. It was a strangely subdued performance from Evans and I’m sure both will want to meet again. Marc Douglas’ record is now 9-4-1, while Dale Evans is 8-1-2. In a super bantamweight contest over six rounds, Robbie Turley completed the second bout of his comeback, with a stoppage victory. Marc Callaghan, had been away for a year due to a shoulder injury and it was the shoulder that ruled him-out this time. Robbie started positively, picking the jabs and getting in the occasional right hand. He looked the sharper of the two. In the second, the Cefn Fforest boxer was controlling the tempo and dropping in double left-hooks. Turley, clearly took both rounds though it was disappointing that a shoulder injury ruled out Callaghan, who was pulled out at the end of the second. Callahan has been a great servant to the game and it was a shame to see the shoulder injury occur again. Robbie Turley, looked sharp and confident and will be back in the British mix in a couple of fights; his record now reads 13-4. Marc Callaghan’s record drops to 19-34-1. In a light welterweight clash, Mitch Buckland put in a solid performance to outpoint Oxfordshire’s Daza Usher over six rounds. The talented 20-year-old, younger brother of Gary Buckland, controlled the fight and boxed well. Usher showed a decent jab and tried to remain competitive but Buckland was always a couple of steps ahead. The Cardiff boxer controlled the fight and finished strongly. He rightly swept all the rounds on referee Martin Williams scorecard, 60-54. The product of St. Joseph’s gym, Newport Mitch Buckland remains unbeaten at 7-0 while Daza Usher tastes defeat, for the second time, and is now 6-2. The Motorpoint Arena show was opened by exciting prospect Alex Hughes from Maerdy. The 20-year-old trained by Gary Lockett, became the first to stop Stoke-on-Trent boxer, Mark Till. You wouldn’t have thought that Hughes was making his debut, as he oozed confidence and showed blistering, powerful hand-speed when he let his hands go. Till really did have a torrid evenings work, as he was out-gunned by Hughes. It was the type of debut that had the press row sitting up and taking notice. Hughes showed a variety of shots, mixed with dazzling hand-speed. The end came in the fourth, and final, round as a bloody and battered Till, was saved from further punishment, in the corner, by referee Martin Williams. Middleweight Alex Hughes record is now 1-0, while Mark Till’s drops to 2-8. ‘The Second Coming’ was promoted by Matchroom Boxing and it was another entertaining evening in the Welsh capital. Now with Lee Selby and Nathan Cleverly leading the way, we can expect more drama and excitement in the future. Marquez: I’m going to make it a war!